I, William Coleman, am writing to interest you in a case that actually happened, concerning one of the topics you are especially interested in, regarding the use of marijuana. As a result, I have but miraculously escaped fatalistic results, which would have come to bear, therefore I would like to speak first-hand, as I could tell you its reactions thru experience, about an otherwise tragic end. Having read your illustrations of other cases of varying sorts, we could help prevent, the use of deadly drugs, which cause a person to do that which under other circumstances he would not do. I am now in the City Hospital, but I am able to released after one more major operation. I have had one leg amputated, and my other leg is in a cast. I also have a broken back and a fractured wrist. I have been in the hospital five months. I had broken enough bones for 16 people. I have had plenty of time to think everything over, and I want to be of service to others, if possible. I should appreciate having a reply at your convenience. I am transmitting herewith two copies of a letter dated July 19, 1939 from Mr. Wn. 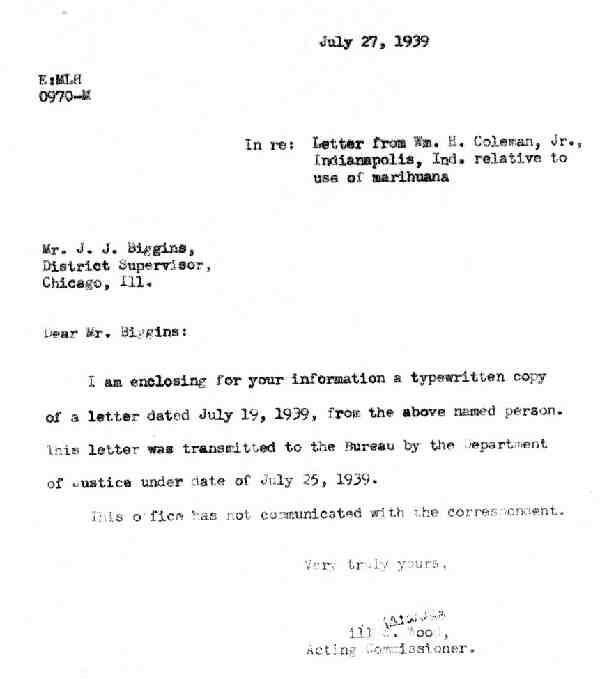 H. Coleman, Jr., Ward F III, city Hospital, Indianapolis, Indiana, which does not appear relevant to any matter within the investigative jurisdiction of this Bureau, but which may be of some interest to you. The correspondent has been advised of the reference. I am enclosing for your information a typewritten copy of a letter dated July 19, 1939, from the above named person. 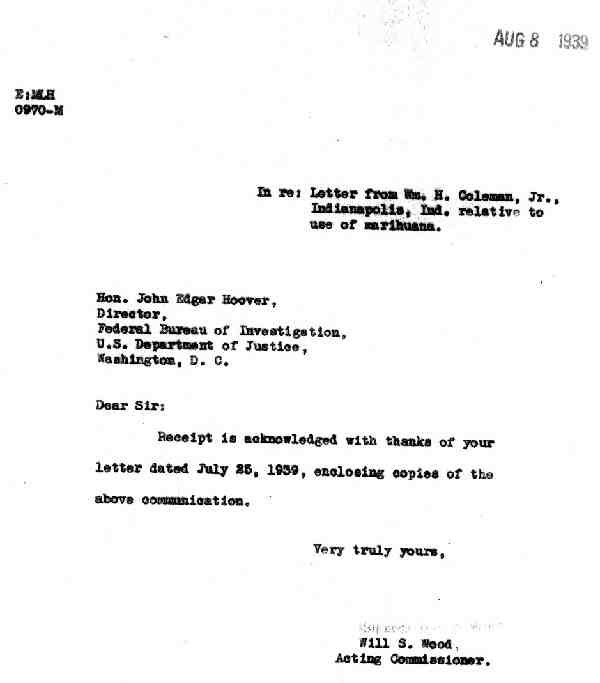 This letter was transmitted to the Bureau by the Department of Justice under date of July 25, 1939. This office has not communicated with the correspondent. Receipt is acknowledged with thanks of your letter dated July 25, 1939, enclosing copies of the above communication. Indianapolis, Ind., relative to use of marihuana. 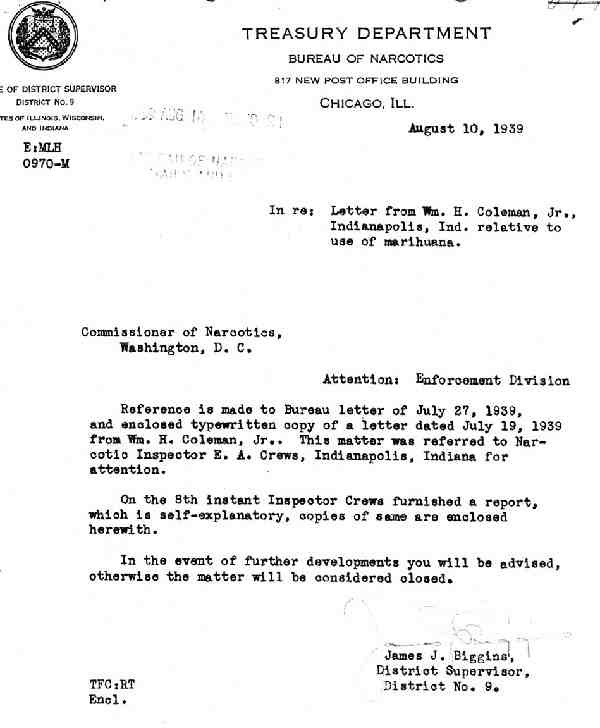 (1)	Reference is made to your letter dated July 31, 1939, identified as above, to which was attached one copy of a self-explanatory Bureau letter dated July 27, 1939, and one letter referred to therein, with directions to make a rather discret investigation and by way of suggestion to see the superintendent of the City hospital, Indianapolis, Indiana, and the attending physician or physicians before seeing Mr. Coleman. (2)	In compliance with above instructions, the writer contacted Superintendent Charles W Meyers, M.D., of the City Hospital, Indianapolis Indiana, on August 7, 1939, and conferred with him relative to the said Wm. H. Coleman, Jr., colored, age 23, who has been a patient at the above hospital since March 3, 1939. Superintendent Meyers advised that the said Coleman was brought into the hospital on the night of March 3, 1939, with a number of broken bones in both legs and fractured vertebrae. 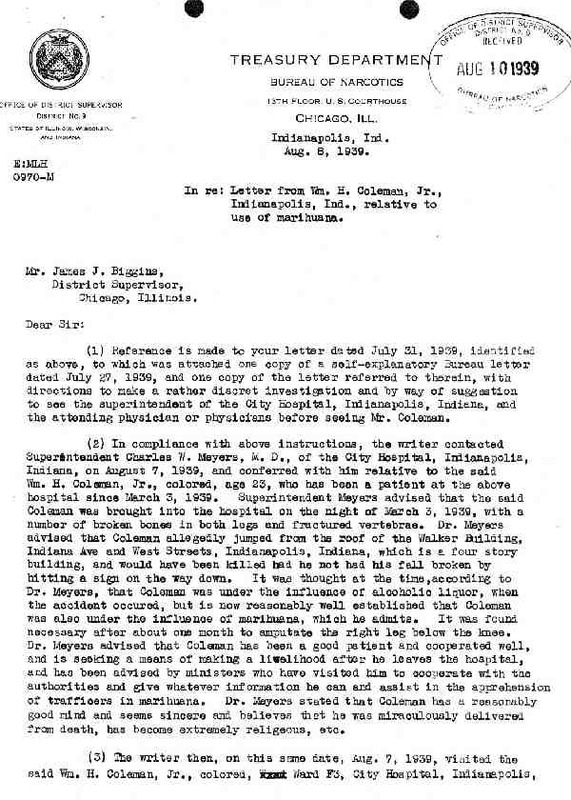 Dr. Meyers advised that Coleman allegedly jumped from the roof of the Walker Building, Indiana Ave and West Streets, Indianapolis, Indiana, which is a four story building, and would have been killed had he not had his fall broken by hitting a sign on the way down. It was though at the time, according to Dr. Meyers, that Coleman was under the influence of alcoholic liquor, when the accident occurred, but is now reasonably well established that Coleman was also under the influence of marihuana, which he admits. It was found necessary after about one month to amputate the right leg below the knee. 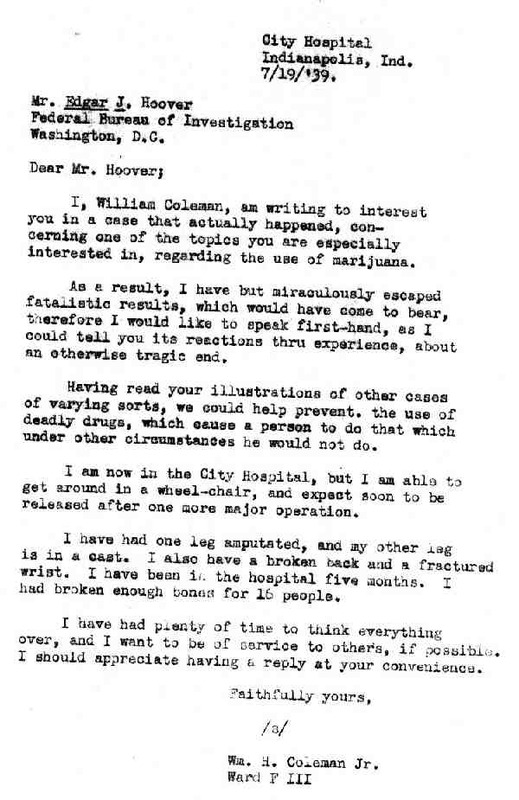 Dr. Meyers advised that Coleman has been a good patient and cooperated well, and is seeking a means of making a livelihood after he leaves the hospital, and has been advised by ministers who have visited him to cooperate with the authorities and given whatever information he can and assist in the apprehension of trafficers(sic) in marihuana. Dr. Meyers stated that Coleman has a reasonably good mind and seems sincere and believes that he was miraculously delivered from death, has become extremely religious, etc. (3)	The writer then, on this same date, Aug. 7, 1939, visited the said Wm. 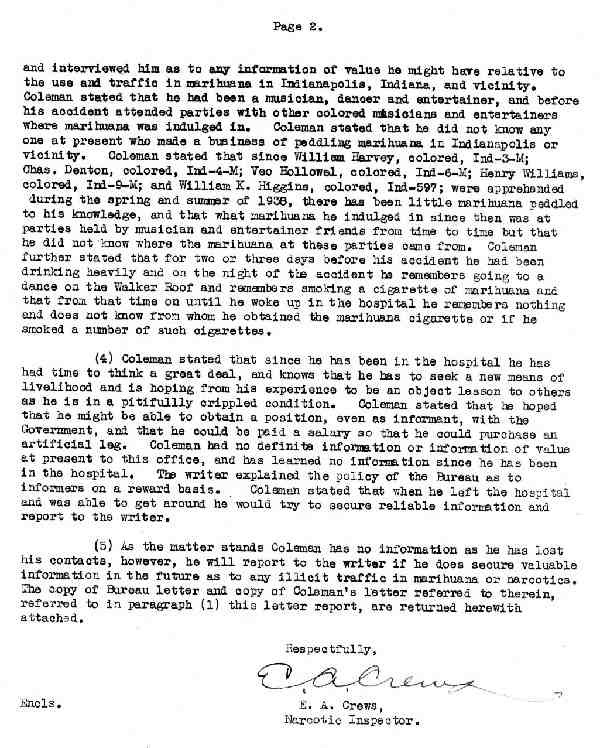 H. Coleman, Jr., colored, Ward F3, City Hospital, Indianapolis, [Page 2] and interviewed him as to any information of value he might have relative to the use and traffic in marihuana in Indianapolis, Indiana, and vicinity. 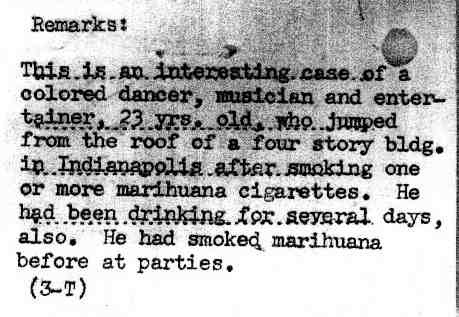 Coleman stated that he had been a musician, dancer and entertainer, and before his accident attended parties with other colored musicians and entertainers where marihuana was indulged in, Coleman stated that he did not know any one at present who made a business of paddling marihuana in Indianapolis or vicinity. Coleman stated that since William Harvey, colored, Ind-3-M; or Chas. Denton, colored, Ind-4-M; Veo Hollowel, colored, Ind-6-M; Henry Williams, colored, Ind-9-M; and William K. Higgins, colored, Ind-597; were apprehended during the spring and summer of 1938, there has been little marihuana peddled to his knowledge, and that what marihuana he indulged in since then was at parties held by, musician and entertainer friends from time to time but that he did not know where the Marihuana at these parties came from. Coleman further stated that for two or three days before his accident he had drinking heavily and on the night of the accident he remembers going to a dance on the Walker Roof and remembers smoking a cigarette of marihuana and that from that time on until he woke up in the hospital he remembers nothing and does not know from whom he obtained the marihuana cigarette or if he smoked a number of such cigarettes. (4)	Coleman stated that since he has been in the hospital he has had time to think a great deal, and knows that he has to seek a new means of livelihood and is hoping from his experience to be an object lesson to others as he is in a pitifully crippled condition. Coleman stated that he hoped that he might e able to obtain a position, oven as informant, with the Government, and that he could be paid a salary so that he could purchase an artificial leg. Coleman had no definite information or information of value at present to this office, and has learned no information since he has been in the hospital. The writer explained the policy of the Bureau as to informers on a reward basis. Coleman stated that when he left the hospital and was able to get around he would try to secure reliable information and report to the writer. (5)	As the matter stands Coleman has no information as he has lost his contacts, however, he will report to the writer if he does secure valuable information in the future as to any illicit traffic in marihuana or narcotics. The copy of Bureau letter and copy of Coleman’s letter referred to therein, referred to in paragraph (1) this letter report, are returned herewith attached. I am writing in regards to the interview which I had with one of your representatives. 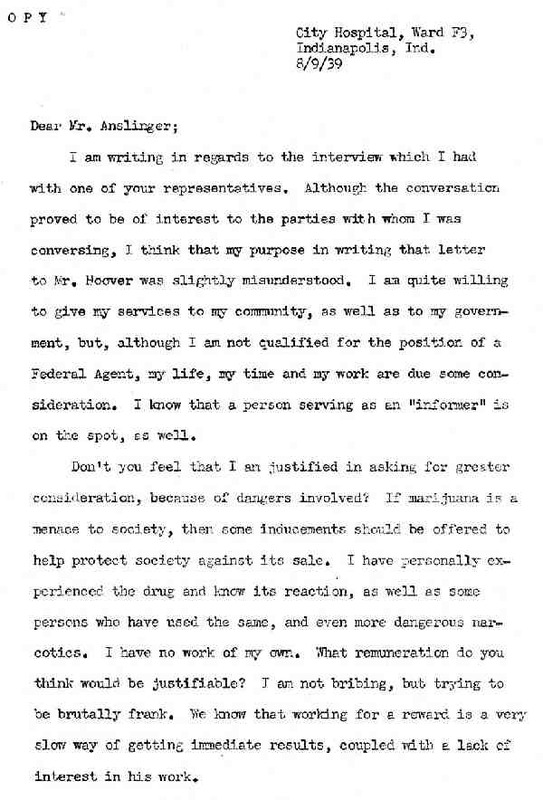 Although the conversation proved to be of interest to the parties with whom I was conversing, I think that my purpose in writing that letter to Mr. Hoover was slightly misunderstood. I am quite willing to give my services to my community, as well as to my government, but, although I am not qualified for the position of a Federal Agent, my life, my time and my work are due some consideration. I know that a person serving as an “informer” is on the spot, as well. Don’t you feel that I am justified in asking for greater consideration, because of dangers involved? If marijuana is a menace to society, then some inducements should be offered to help protect society against its sale. I have personally experienced the drug and know its reaction, as well as some persons who have used the same, and even more dangerous narcotics. I have no work of my own. What remuneration do you think would be justifiable? I am not bribing, but trying to be brutally frank. We know that working for a reward is a very slow way of getting immediate results, coupled with a lack of interest in his work. Now, I shall be glad to be of what service I can, but that service will be limited to whatever demands my time makes upon me, wholly or partially. 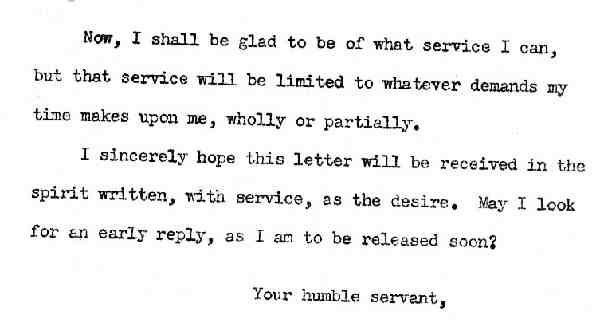 I sincerely hope this letter will be received in the spirit written, with service, as the desired. May I look for an early reply, as I am to be released soon? Reference is made to Bureau letter of July 27, 1939, and enclosed typewritten copy of a letter dated July 19, 1939 from Wm. H. Coleman, Jr.. This matter was referred to Narcotic Inspector E.A. Crews, Indianapolis, Indiana for attention. On the 8th instant Inspector Crews furnished a report, which is self-explanatory, copies of same are enclosed herewith. In the event of further developments you will be advised, otherwise the matter will be considered closed. 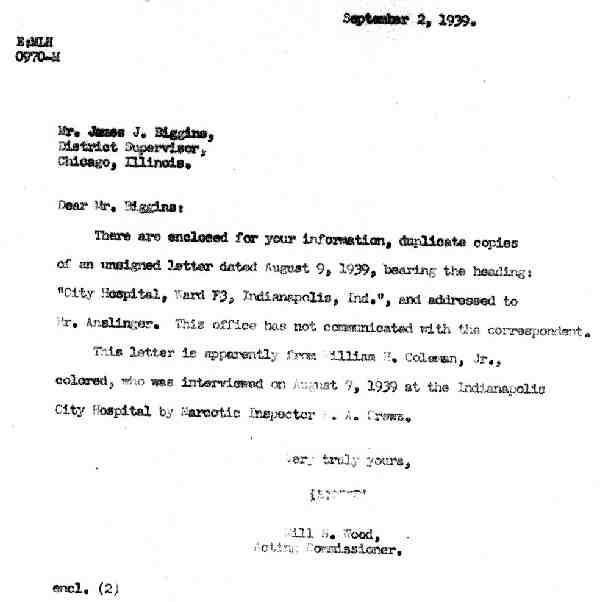 There are enclosed for your information, duplicate copies of an unsigned letter dated August 9, 1939, bearing the heading: “City Hospital, Ward F3, Indianapolis, Ind.”, and addressed to Mr. Anslinger. This office has not communicated with the correspondent. 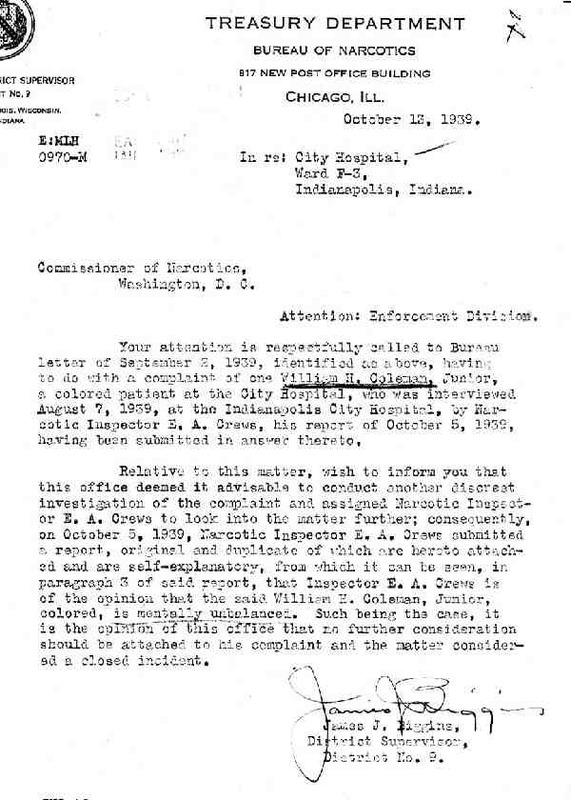 This letter is apparently from William H. Coleman, Jr., colored, who was interviewed on August 7, 1939 at the Indianapolis City Hospital by Narcotic Inspector #. A. Crows. 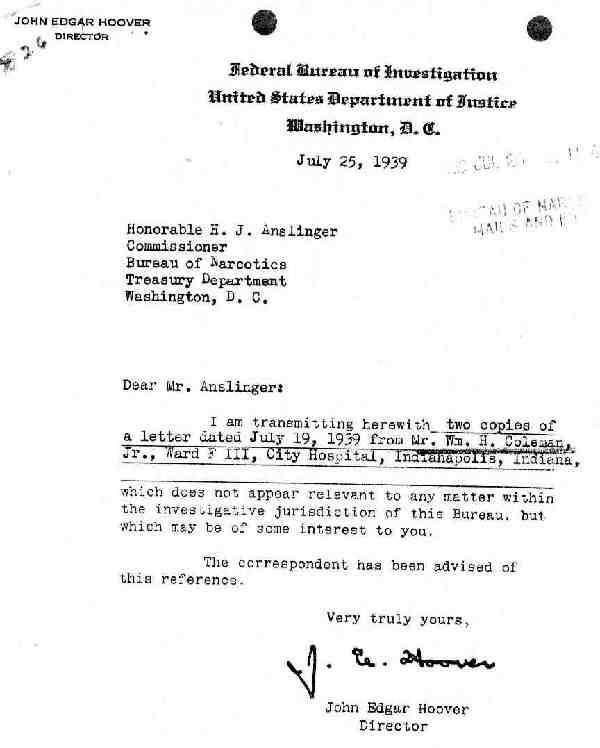 (1)	Reference is made to your letter dated September 8, 1939, identified as above, enclosing one copy of a self-explanatory Bureau letter dated September 2, 1939, together with one copy of the letter addressed to Mr. Anslinger, referred to therein, your letter pointing out that the Bureau letter does not direct another investigation, but that you think it might be well to conduct anther investigation, but that you think it might be well to conduct anther discreet investigation along whatever lines the writer deemed expedient. 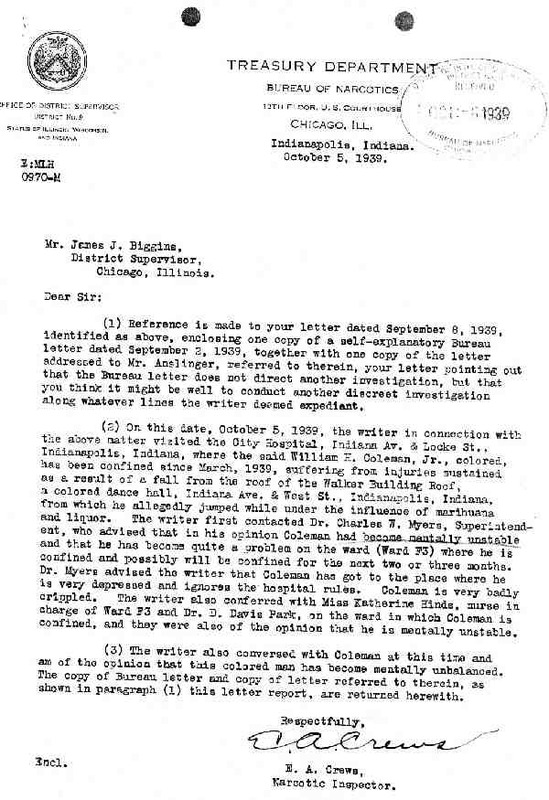 (2) On this date, October 5, 1939, the writer in connection with Indianapolis, Indiana, where the said William H. Coleman, Jr., colored, had been confined since March, 1939, suffering from injuries sustained as a result of a fall from the roof of the Walker Building Roof, a colored dance hall, Indiana Ave, & West St., Indianapolis, Indiana, from which he allegedly jumped while under the influence of marihuana and liquor. The writer first contracted Dr. Charles W. Myers, Superintendent, who advised that in his opinion Coleman had become mentally unstable confined and possibly will be confined for the next two or three months. Dr. Myers advised the writer that Coleman has got to the place where he is very depressed and ignores the hospital rules. Coleman is very badly crippled. The writer also conferred with Miss Katherine Hinds, nurse in charge of Ward F3 and Dr. D. Davis Park, on the ward in which Coleman is confined, and they were also of the opinion that he is mentally unstable. (3)	The writer also conversed with Coleman at this time and am of the opinion that this colored man has become mentally unbalanced. The copy of Bureau letter and copy of letter referred to therein, as shown in paragraph (1) this letter report, are returned herewith. Your attention is respectfully called to Bureau letter of September 3, 1939, identified an above, having a colored patient at the city Hospital, who was interviewed August 7, 1939, at the Indianapolis City Hospital, by Narcotic Inspector E.A. Crews, his report of October 5, 1939, having been submitted in answer thereto. Relative to this matter, wish to inform you that this office deemed it advisable to conduct another discreet investigation of the complaint and assigned narcotic Inspector E.A. Crews to look into the matter further; consequently, on October 5, 1939, Narcotic Inspector E.A. Crews submitted a report, original and duplicated of which are hereto attached and are self-explanatory, from which it can be seen, in paragraph 3 of said report, that Inspector E.A. Crews is of the opinion that the said William H. Coleman, Junior, colored, is mentally unbalanced. Such being the case, it is the opinion of this office that no further consideration should be attached to his complaint and the matter considered a closed incident.